Most of the true chameleons tend to have a greenish color, at least part of the time. 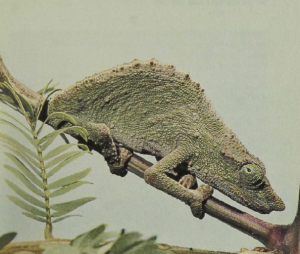 In contrast, the dwarf chameleons, 3 to 4 inches long, are mainly brownish, though some of them show markings on the sides of the body, which give them the appearance of dead leaves. This coloration makes it clear that these chameleons have descended to the ground and, secondarily, become terrestrial. They have retained the curious grasping foot but lack the prehensile tail. Native to Central Africa, including Madagascar, dwarf chameleons can sometimes be found under rocks. Some prefer cooler temperatures than the tree chameleons: instead of values near 30°C (86°F) one observes levels near 28°C (82°F). While they prefer ground localities, these animals can climb and do ascend small bushes when hunting their insect prey.